Key West, Florida officials are excited to host a historic three-day conference with honored guests from Havana, Cuba, at Harry Truman’s Little White House. The organizers hope the event will be the first of many collaborations between the two cities. Hayley Snow, food critic for Key Zest magazine, is not only covering the conference, but has also been drafted to work as an addition to the catering staff—the company owned by her mother. As guests begin to arrive for the kick-off dinner, it becomes clear that mediating squabbles between the Americans and their guests will be a top priority. Case in point is a heated discussion about Ernest Hemingway, who split his time between Key West and Havana, but who gave the Nobel prize gold medal he was awarded to Havana, where it has been ever since. As a good will gesture, the medal has been loaned to Key West, but when the guests are ushered to the trophy case to view it, the priceless medal is gone. Security is tight, so the police are sure the theft was an “inside job.” Suspicion falls on one of the busboys, who mysteriously disappears right after the theft is discovered. Hayley and the catering staff do their best to keep the party going while the search goes on. But no one is prepared for the grisly discovery of the busboy, who tumbles out of a storeroom, the victim of a stabbing. 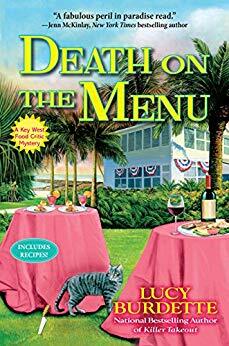 “Death on the Menu” is the eighth in the Key West Food Critic series written by Roberta Isleib under the pen name of Lucy Burdette. There’s a lot to love about this series—deft plotting, likeable characters, and an ending that always satisfies. But one of the things I love the best is how the author transports her readers to Key West with every page, describing real landmarks and restaurants with such realism that I feel I’m actually there. Magical and delicious fun! Be the first to comment on "“Death On The Menu” by Lucy Burdette"